Heterosis (hybrid vigor) has proven its value in many agricultural sectors—whether production of hybrid corn, hogs or beef. There are three kinds of heterosis; individual (the calf), maternal, and paternal. Of the three, paternal heterosis has had the least attention. Research studies have reported up to 25 percent improvement in pounds of calf weaned per cow exposed to a bull, when crossbred cows produce crossbred calves. Crossbred calves demonstrate increased weaning weights and yearling weights when compared with calves of a single breed. Maternal heterosis, seen in the crossbred cow, increases her performance and that of her calves. She reaches puberty earlier, rebreeds quicker after calving, has greater survival rate in her calves, stays in the herd longer, and produces more pounds of calf during her lifetime. Now some producers are looking at the possible advantages of utilizing paternal heterosis, and benefiting from improvement in reproductive characteristics of the bull. Scott Greiner, Professor and Extension Beef Cattle Specialist, Virginia Tech, says there has probably been less research done on paternal heterosis than on individual and maternal heterosis. “The studies that have been done have shown some advantages, namely in terms of fertility, a little improvement in number of cows settled, and cows settled earlier in the breeding season,” he says. Anecdotally, hybrid bulls are thought to have a little more enthusiasm to go out and cover a lot of territory and breed a lot of cows. “This can be seen as an advantage when a producer is running cattle in large pastures with more cows per bull, in the larger range operations—as opposed to the smaller cow-calf herds in our part of the country,” he says. “As I visit with producers here, and we look at the research, the hybrid bull allows for some practical crossbreeding (and heterosis) to occur in small herds. It simplifies a crossbreeding system. The traditional rotational system or terminal sire system is not applicable for a lot of our small herds,” says Greiner. A small producer may have only one breeding pasture and one bull. It becomes impossible or too complicated to facilitate the traditional crossbreeding system. “By using a hybrid bull, such as Sim-Angus or Balancers, which are mostly half bloods, some hybrid vigor can be introduced into the herd. By keeping those replacement heifers, some maternal heterosis can be added, in a relatively simple and practical fashion, without having wide fluctuations in breed composition from one generation to the next.” The producer can keep the desired breed mix the same. Some of the breeds that have combined with Angus (both black and red) to create composites include Simmental, Gelbvieh and Limousin. “Maine Anjou and Chianina have gone that route for a long time, before anyone else—in terms of recording and documenting pedigrees, etc.” Even earlier, composite breeds were created with Brangus, Beefmaster and Santa Getrudis. There are many more opportunities today to utilize different breeds in a composite. “From a practical standpoint in our area of the country, creating heterosis in the calves is the most applicable reason for use of a hybrid bull, as opposed to the reproductive advantage of the hybrid bull—though this can certainly be an added bonus,” says Greiner. “In our region we have definitely seen increased/renewed interest in crossbreeding, and many producers are trying to get back to the basics. They recognize that heterosis is a very powerful tool—particularly for enhancing productivity of their cows in terms of fertility and maternal aspects. They can increase the number of calves born and the number of calves that make it to weaning, and for selling. Heterosis has been well documented to contribute significantly to the cow side,” he says. “Observing and measuring the difference between hybrid and purebred bulls in terms of fertility in a real world setting would be hard to measure, however, in our type of production system. Some of these things will vary from individual to individual bull as well. The basic fundamentals of proper care and nutrition, utilizing a breeding soundness exam, along with putting a bull with the right number of cows, should apply to hybrids as well as purebreds. If all this is done properly, in most of our production settings, the reproductive advantages of the hybrid bull may be difficult to measure. The much more widely recognized advantage is the ability to introduce some hybrid vigor and heterosis in a simple and practical fashion—in one generation,” he says. “Many producers now embrace the opportunity to inject some heterosis, and this can be done with a composite or percentage bull. At the same time they are not swaying the genetic makeup of their herd too far one way or another as much as when using a purebred bull. Producers would like to minimize that variation as best they can, for a variety of reasons. Using a composite bull that provides the heterosis they’re looking for is appealing, realizing they are not going to maximize heterosis but merely enhance it; this is a way to optimize it and keep everything in balance,” says Greiner. If producers are keeping heifers to go back into the herd, they can keep the breed mix the way they want it, by using composite bulls. On the other hand, if they want to maximize heterosis they could use a crossbred bull that embodies two different breeds than what they have in the cow herd, to create a four-way cross. “We don’t see much of that here, just based on the breeds we’re using, but it certainly can be a good option. Our cow herds are predominantly Angus, but some of the other breeds certainly bring some things to the table, and if we can match things up right, this can be an advantage,” he says. “One of the big factors, over time, has been the implementation of tools to help us do that. We now have a complete genetic profile and EPDs on composite and percentage bulls, and we can use those same selection tools that we are accustomed to using, and apply them.” This simplifies things and can help guide producers in the right direction. People with small herds can’t use a complicated rotational breeding system for crossing. The composite bull makes it much easier; all they need is one bull in one breeding pasture. 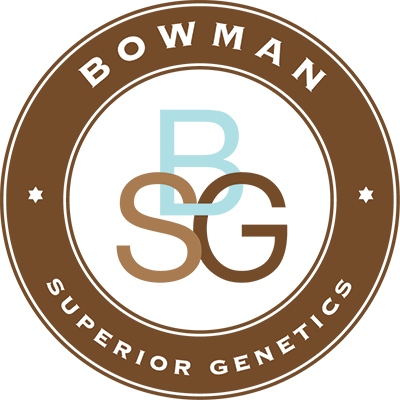 “Today in our industry there is unquestionably renewed interest in hybrid vigor and crossbreeding, particularly on the maternal side. I think that from an industry standpoint, the last several years has seen an evolution that’s come to fruition, in that we now have the tools and the science to do accurate genetic selection with hybrid bulls. We didn’t have this capability before. Basically we’ve now put purebred and hybrids on the same playing field when it comes to selection,” he says. We’ve taken some of the guesswork out of it, for selecting a good hybrid bull. “We now have the technology and selection tools in place to do what we want to do, and it’s just a matter of using those correctly, to capture all the things we want to capture. We can crossbreed and we can use heterosis in conjunction with in-breed selection simultaneously, and this is a very powerful tool,” he says. This in itself has helped generate more interest in using hybrid bulls than what we’ve seen before. People are now considering them seedstock; this term no longer refers only to purebreds. “Just as importantly, seedstock breeders have embraced that concept, as well. They often produce hybrids for some of their customers. I think the quality and the genetic merit of the average hybrid bull today is quite a lot better than it was a few years ago.” Early on, about the best you could get was a crossbred bull that was not necessarily from a planned mating. Seedstock producers were generally not producing crossbreds. But this isn’t true anymore. Breeders today are flushing their best cows to make hybrids, and bull buyers can have faith in the quality of bulls they are getting. This has opened the door to a lot of new interest. Commercial cattlemen are taking a look at what these hybrids can offer their own breeding programs. There are many options to choose from, in the various types of hybrids and composites being created today—with various percentages of continental and British breeding. “What I stress with our producers is that it still boils down to having a plan. You need to select the right genetics in those hybrid bulls—to move your herd forward and contribute to your overall genetic plan. If you use the tools available to help you do this, it can be beneficial. Crossbreeding must be done correctly. There are advantages, and you can capture heterosis and use it to your advantage, but at the same time we need to do that in a planned fashion, with some goals and some selection pressure,” he says. Why do something half way when you can maximize it?